Carbon is a library for building component-based user interfaces in UITableView and UICollectionView inspired by React. This make it painless to build and maintain the complex UIs. Uses DifferenceKit which is highly optimized based on Paul Heckel's paper for diffing. Declarative design and diffing algorithm make your code more predictable, debugging easier and providing beautiful animations to users. Our goal is similar to IGListKit and Epoxy, we respect those library as pioneers. Described here are the fundamentals for building list UIs with Carbon. The API document will help you understand the details of each type. For more advanced usage, see the Advanced Guide. And the more practical examples are here. Component is the base unit of the UI in Carbon. All elements are made up of components, and it can be animated by diffing update. UIView, UIViewController, and its subclasses are laid out with edge constraints by default. Other classes can also be rendered as Content by implementing layout function to component. The value returned by referenceSize is used as the size of component on the list UI. Note that UITableView ignores width. If returning nil, it falls back to default such as UITableView.rowHeight or UICollectionViewFlowLayout.itemSize. Therefore, automatic sizing can also be used. Definition below is the simplest implementation. It's not mandatory to conform to Equatable. If the component have values that can't equality comparison ​​such as closure, it can explicitly shift off the comparisons by implementing shouldContentUpdate. This is a node representing header or footer. The node is wrap an instance of type conforming to Component protocol and works as an intermediary with DifferenceKit for diffing. CellNode is a node representing cell. Unlike in the ViewNode, this needs an id which Hashable type to identify from among a lot of cells. The id is used to find the same component in the list data before and after changed, then calculate the following kind of diff. The id can be predefined if conforming to IdentifiableComponent. Section has a header, a footer and a group of cells. A group of cells can be contains nil, then skipped rendering of it cell. This also needs to specify id for identify from among multiple sections, then can be calculate the several kind of diff. The components are displayed on top of list UI by render via Renderer. 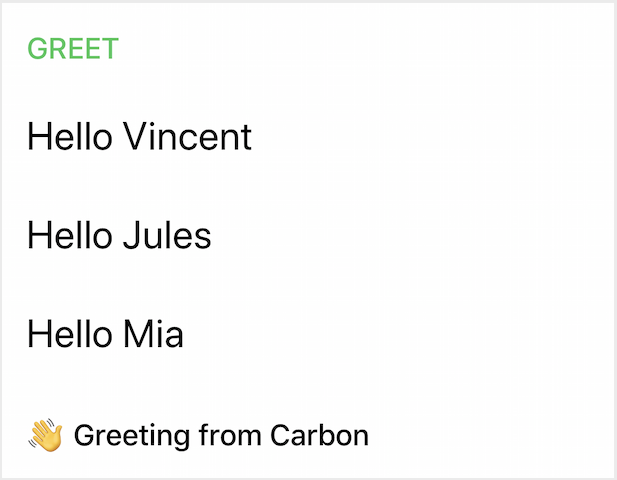 Boilerplates such as registering element types to a table view are no longer needed in Carbon. The adapter acts as delegate and dataSource, the updater handles updates. You can also change the behaviors by inheriting the class and customizing it. There are also UITableViewReloadDataUpdater andUICollectionViewReloadDataUpdater which update by reloadData without diffing update. Note that it doesn't retain target inside Renderer because it avoids circular references. When render called again, the updater calculates the diff from currently rendering components and update them with system animation. Since there are several style syntaxes for passing group of sections, please check the API docs. Of course, the content of component can use custom class. You can also instantiate it from Xib. It can be inherited whichever class, but the common means is inherit UIView or UIViewController. return HelloMessageContent.loadFromNib()  // Extension for instantiate from Xib. Not in Carbon. IdentifiableComponent is a component that simply can predefine an identifier. It can be omitted the definition of id if the component conforms to Hashable. Cell selection can be handled by setting didSelect to the instance of UITableViewAdapter or UICollectionViewAdapter. However, we recommend to make the Content of the component to the class inherited from UIControl. It's more maintainable and extensible. var onSelect: (() -> Void)? In this way, in order to cancel the selection by scrolling, you need to implement the following extension.